This was my first gingerbread, and it's from Dorrie Greenspan's Baking from My Home to Yours. Since I let my fiancé help choose the recipe, predictably it had chocolate. I am what you might call a ginger fiend, so this was a good mix for the both of us. Although traditionally associated with Christmas, gingerbread is, according to the Woman's Day Encyclopedia of Cookery, one of the oldest cakes dating all the way back to the Middle Ages when it was bestowed on dueling knights by the women they sought to impress and often decorated with gold leaf in the shape of a fleur-de-lys. In English Food, Jane Grigson describes a recipe for gingerbread from 1430 which calls for warming a quart of honey, skimming it and coloring it with saffron or sanders before mixing in enough bread crumbs to shape it into a loaf without further cooking. Spice breads appear throughout Europe, as in the pain d'épices in France, the lebkuchen in modern-day Germany, Switzerland and Austria (although traditionally this is flavored with honey, cinnamon, cloves, nutmeg and cardamon and not a trace of ginger) and the panforte in Italy. Chocolate is not necessarily the traditional accompaniment, and Woman's Day offers recipes for lemon sauce and cream-cheese frosting, and breads baked with honey, spices and even blueberries. 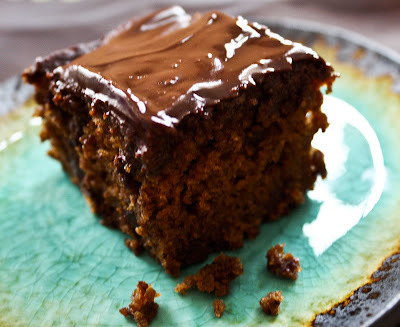 However, Greenspan's cake is very much like the traditional gingerbread given by Woman's Day (not to be confused with the Grasmere Gingerbread of England which Grisgon describes as a "crumbly biscuit" or the Julpepparkakor or gingersnaps of Scandinavia), which is described as "a flat, square, spicy bread-cake made with brown sugar or honey and molasses (or just molasses), leavened with baking powder...and heavily spiced with ground ginger and other spices." Whisk flour, baking soda and spices and set aside. If you're using a stand mixer, fit it with the paddle attachment, set on medium, and cream the butter and brown sugar together until smooth, about 3 minutes. Add the eggs in one at a time, beating for 1 minute after each addition. My mixture looked curdled at this stage, but Dorie says that's okay, so I believe her! Add the molasses and continue beating until the mixture is smooth. Reduce speed to low and the melted chocolate and the sugared ginger. Then add the dry ingredients in three stages, alternating with the buttermilk. Begin and end with the dry ingredients. Do not over mix the batter. 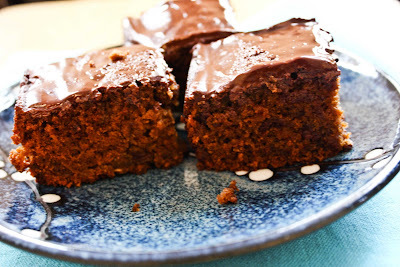 Fold in the chopped chocolate and pour the batter into your 9-in square baking pan. Bake for 40 minutes until the sides start to pull away from the pan. My cake was domed, but it settled after a few minutes of cooling. Cool in the pan on a rack for 10 minutes, then take it out of the pan and cool to room temperature before icing. Melt the chocolate together with the coffee in a double boiler. Once the chocolate is melted, remove it from the heat and stir in the butter one tablespoon at a time. Sift the confectioner's sugar over the mixture and stir it in. Transfer the mixture to a bowl and let it set for 10 minutes. Pour the icing over the center of the cake and spread it to the sides. Let the iced cake sit for 30 minutes before cutting into 9 pieces. I love gingerbread. What a wonderful twist on one of my favorites! What a delicious looking cake. I bet it's scrumptious. Thanks for the great recipe. I found you through the foodie blogroll. I'm glad I did. This looks wonderful! I love the sticky-looking chocolate and coffee frosting. your gingerbread looks so good, The photos are amazing. 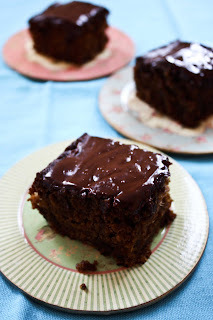 Can I use black treacle instead of molasses since i didn t find any ? Hi Snooky Doodle, I think you'd want to be careful about using black treacle instead of molasses, because I believe black treacle is much stronger. I'm actually not sure what an appropriate substitution would be, perhaps maple syrup, although the flavor and consistency are both different. Or you might try a dark honey, as I've seen gingerbread recipes that use honey and not molasses. Hope that helps! Holy mother, this sounds amazing. oh my god...this cake is amazing!!!! i join your site, visit me and support me if you like!